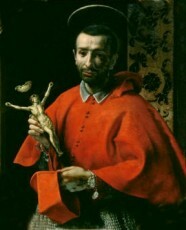 St. Charles Borromeo was the son of Gilberto II Borromeo, the Count of Arona, and Margherita de Medici, the sister of Pope Pious IV. When Borromeo was about twelve years old, his uncle Giulio Cesare Borromeo, resigned him to the office and dignity of an Abbot. He gave the revenue from this job in charity, to the poor. He studied civil and canon law at Pavia. With a little delay in his studies due to his father’s passing, he resumed his studies and in 1559 he took his doctoral degree. In 1560 his uncle, Cardinal Angelo de’ Medici, was raised to the pontificate as Pope Pius IV. Pius IV named Borromeo as Protonotary Apostolic, “Secretary of State”, entrusted with the public and the privy seal of the ecclesiastical state. He then named Borromeo to the post of Cardinal of Romagna and Supervisor of the Franciscans, Carmelites and Knights of Malta. At the age of twenty-two, St. Charles was highly trusted at the papal court. Soon afterwards, Pope Pius IV raised him to the Archbishop of Milan. He wanted to please the Pope, so he established an academy of learned persons, the Academy of the Vatican Nights, and published their memoirs. At the same time, he founded and endowed a college at Pavia, today known as Almo Collegio Borromeo, which is dedicated to St. Justina of Padua. On the death of his elder and only brother Federigo, his family urged Borromeo to quit the Church and marry to have children, so the family name would not become extinct. St. Charles declined the proposal, and worked even harder for the welfare of the Church. Thanks to his influence over Pope Pius IV, he facilitated the final deliberations of the Council of Trent. He had a large share in the creation of the Tridentine Catechism. St. Charles had many reforms through his high position, and these reforms had much opposition. The governor of the province, and many of the senators addressed complaints to the courts of Rome and Madrid. They were worried that the Cardinal’s Ordinances would encroach upon the civil jurisdiction. He also faced staunch opposition of several religious orders, Particularly the Brothers of Humility. Some members of that society formed a conspiracy against his life, and a shot was fired at him in the archiepiscopal Chapel. His survival was considered miraculous. Years later he was seized with an intermitent fever, and died at Milan on November 3, 1584. He was canonized in 1610, and his feast day is November 4th. St. Charles Borromeo was born into a noble family. He desired the religious life, and his uncle was Pope Pius IV. He appointed St. Charles to several positions, and finally as Archbishop of Milan. He helped with many reforms in the Church, and played a big part in the Council of Trent. He had a large share in the creation of the Tridentine Catechism. His family asked him to leave the Catholic Church, and marry to carry on the family name, after his brothers passing. He refused them, and worked even harder for the Church.